Effective Startup Learning: new ventures need to learn, and they need to learn fast, or they will fail fast. The trouble is that you are already run off your feet. To take time out to ‘learn’, seems like a luxury. However, there’s a good way to do it. It’s called double-loop learning. Double-loop learning sounds like a complex and academic way to achieve effective startup learning. It was developed by a leading professor. Chris Argyris was a highly respected Harvard Business School Professor and is known for his concept of double-loop learning (with Donald Schön)—among other concepts of effective organizational behavior. Argyris considered that success in the marketplace depends on learning, and that most people don’t know how to learn. So, his approach was severely practical and he focused on learning that was about efficacy, rather than just efficiency. Effective startup learning will begin with the use of double-loop learning. The “double-loop” in double loop learning is about questioning the basic strategy and foundation on which you are working as well as what’s to be learned from the actions you’ve taken. It means that you have to look inward at your assumptions, so that you can indeed, be effective. So often, a startup will try something, find holes in it and then rush into another solution without pausing for breath. I know that to my cost. We built effective startup learning into most meetings. It did not require the team to attend courses. It became part of our management practice—and part of Team Behavior Building. You may react to this way of effective startup learning by agreeing in principle, but insisting that you need to act, rather than reflect. You do so at your peril. Interestingly enough, there are many entrepreneurs who do effective startup learning almost instinctively, and when they do, it gets called a business pivot. For instance, rather than changing the marketing method because it does not seem to be working, you reflect and realize that you have been using the wrong channel to reach the market, or that you have been aiming at the wrong people. Worse, it may be that your product was aimed to solve the wrong problem. Put this way, you can probably easily appreciate the value of effective startup learning using the principle of double-loop learning. 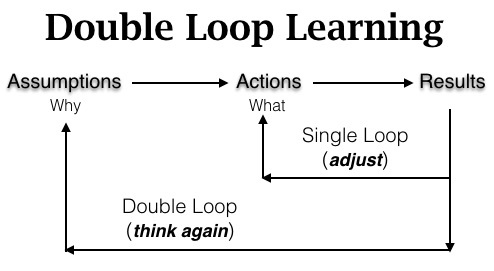 If you use double-loop learning, you will go through the single loop, then the double loop. In the process, your discussion will be on the basis of evidence. Then you will conclude that your original assumptions were right and you should preserve them—or mistaken, and that you should pivot in some way to better address those assumptions.